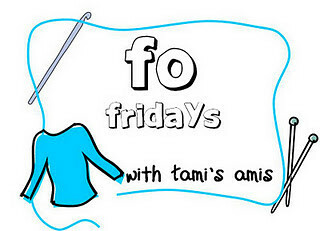 You may not be surprised to know that today's FO is another shawl! It added a valuable 369 yards to my Stash Dash 2013 total though! 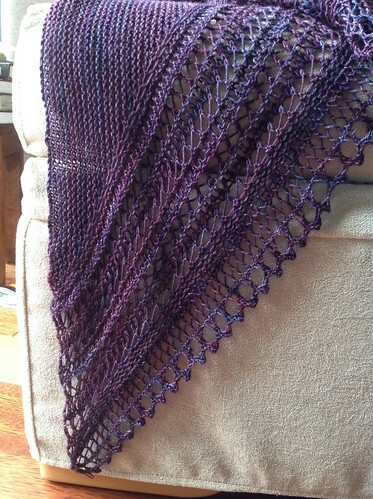 I already showed you a preview of this shawl, Henslowe by Beth Kling, a couple of weeks ago, and I loved making it. That love was partly inspired by the yarn, because Malabrigo Sock is one of my favourite yarns. It is soft, bouncy and has gorgeous colours. The rest of my enjoyment came entirely from the pattern. It was so much fun to knit. 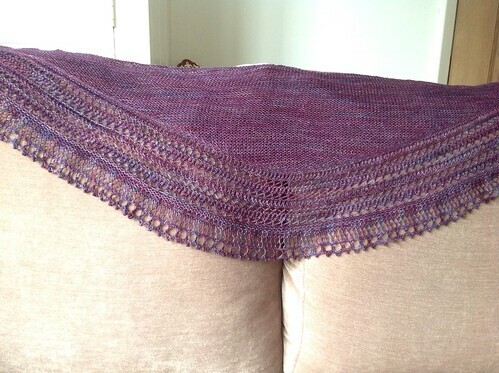 I wish I had a better photograph of this shawl, because it deserves a gorgeous photo shoot. Sadly, it's just too blooming hot to wear it in my normal "studio", aka my porch. It's a great place to take photos, normally, because it is painted white, is just the right size to get a nearly full length shot and gets lots of light because of the glass that faces East, to get morning light. However, it is small, painted white and has lots of glass. It is like a sauna in there at the moment. I can't tolerate it long enough to take photos of myself in a wool shawl, it's not going to happen. So here are the photos I could give you. I love the construction of this shawl, which involves knitting in several different directions during the course of the knit. You don't have any time to get bored. However, none of the parts of the pattern are difficult. It really is a great pattern for keeping you entertained, but still allowing you to knit without much concentration. I managed to work on the lace pattern whilst at knit night and didn't need to rip anything out because of any mistakes I made there! The first section of lace has a pattern repeat that is worked first on the right side and then alternates to working the repeat on the wrong side, which means this shawl is reversible. Which is nice for wrapping artistically round the neck! 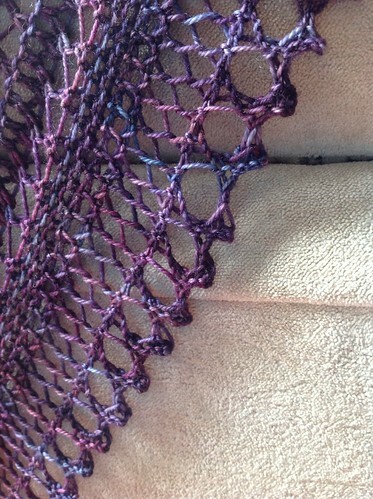 The final section of lace is a knitted on edging, and I love the way it looks. It is something I've been thinking about recently, the idea of knitted on edgings. In fact, Martine of iMake was recently discussing the Craftsy class with Franklin Habitat called Heirloom Lace Edgings, and I was thinking about taking this class. Sadly, I already have a mountain of classes on Craftsy that I need to finish first! It is something that I think may sneak into my next shawl design because I love how it finishes a shawl and gives it a nice elastic edge. It's on these close up shots that you can see how pretty the subtle colour variations in this yarn are. 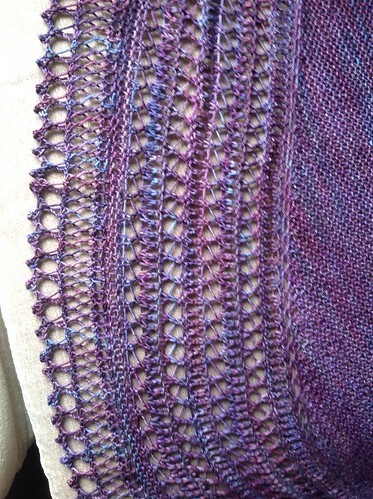 It just adds movement and depth to the shawl when you use tonal yarns.